What can be said that hasn't been said? 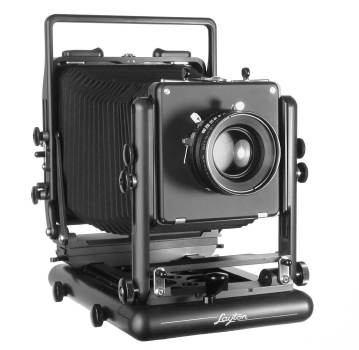 Considering large format cameras have been in production for over a century, many made in the last fifty-plus years is still useable if it's in working condition, and many more are new within the last twenty years, you have a lot of choices. Many photographeras have their own catagories of large format cameras, but mostly there are two types, with one having two types. The two general types are monorail cameras, which are primarily used for studio, architectural, portrait and other photography where you can set the camera up for some length of time and control, and want lots of front and rear controls, and flat-bed or field cameras, which fold into a compact size. These cameras are differentiated by their range of bellows and controls, to be field cameras, used for landscape and nature photography, and press cameras, formerly used for newspapers, magazines and street photography, and mostly associated with Speed Graphic cameras. I won't get into the details of the cameras, there are many resources on these. I just want to say a few things from my short experience. First, before you buy a camera, decide what you want to photograph. It doesn't pay to buy one you'll replace in 1-2 years because it simply won't work for you. Then, do your homework. There are currently over two dozen camera companies, and many models to choose from for your work. Each have different features and capabilities. I won't talk much about the types for you, that's for your research to do. I choose a Layton L-45A for a variety of reasons. First, although I want to focus on nature and landscape photography, I intend to try architectural, studio and portrait photography, which means it has to have a wide range of features and controls, but mostly be a field camera for carrying and hiking. You can view the specifications of this camera on the Website. Second, I wanted it to be easy to learn and use. Trying some of them I found learning and using varies with the camera as they're all differently designed and built. The basics remain the same but each camera's controls vary. The controls have to be intuitive and instinctive to use, and I personally found some, like Linhof's, take awhile to learn from their unique features and design. Often the hands-on experience is great for removing your choices and learning what doesn't work for you. In the end, for me it was a choice between the Horseman LE for its simplicity and full range of features and the Layton for it's features, compact design, size and ease of use. I don't plan to add other large format cameras, so the Layton was the choice for my adventure.